I love to bake. I can make all kinds of different tortes. It’s really funny when I’m in a bakery section of a store that specializes in fancy cakes, I can walk along and say I can make that, that and that. Then I look at the prices and just shake my head knowing that the prices they’re charging are outrageous. 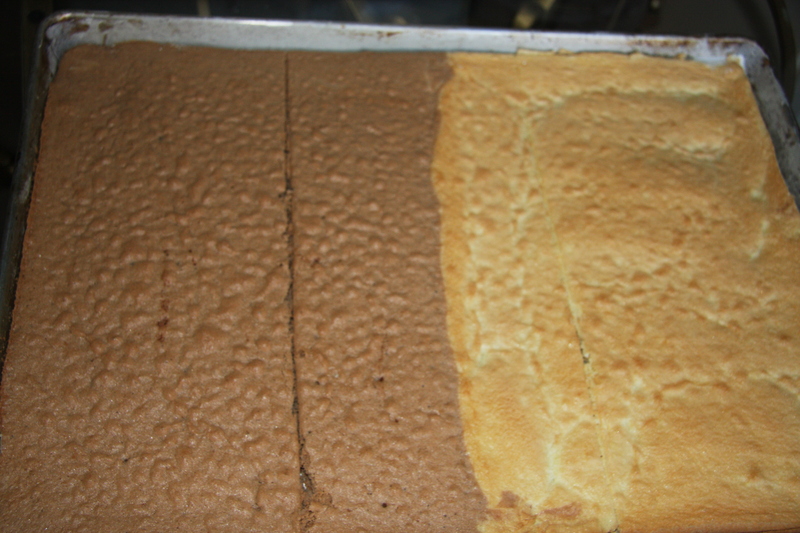 There is one torte I make, where the pattern is different on both sides of the same piece once you cut a slice. I’ve seen it in a Polish deli and if I didn’t know how it was done I would drive myself crazy trying figure it out. I’m not a decorator. Your basic icing with a few bits and bobs or squiggles on for decorating. I don’t have much patience for decorating fancy things. My daughter-in-law is absolutely fantastic at it. Theme parks, Disney characters, zoos full of animals on different levels, just about anything you can think of. I just marvel at what she can do. I’m lucky to whip up some whip cream and try to smooth it on a few layers and some on the top. That’s the extent of my decorating, though my cakes do taste really good. I’m always trying to learn different recipes and techniques. The only way to learn is through trial and error, no matter how frustrating at the time it may seem. I love to travel and take cooking courses. I have cooked with Cordon Bleu chefs and a TV chef. Such amazing experiences for which which I am so grateful. Don’t let any recipe intimidate you, especially tortes. They are very simple to make. 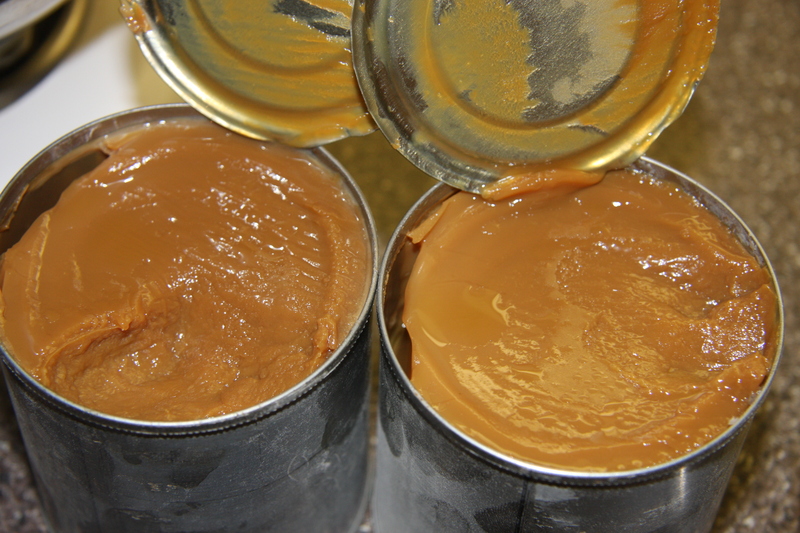 The day before you make the cake, make some caramel from sweetened condensed milk. Into a large pot of water, place 2 containers of sweetened condensed milk. Make sure they are totally covered with water. I also keep a kettle of hot boiling water on hand to add to this when the water reduces. Bring the water and sweetened condensed milk to a boil. Reduce and simmer partially covered at a low heat for 2 hours. Yes you read that right, 2 hours. Remove the tins from the heat and water and cool COMPLETELY before opening. 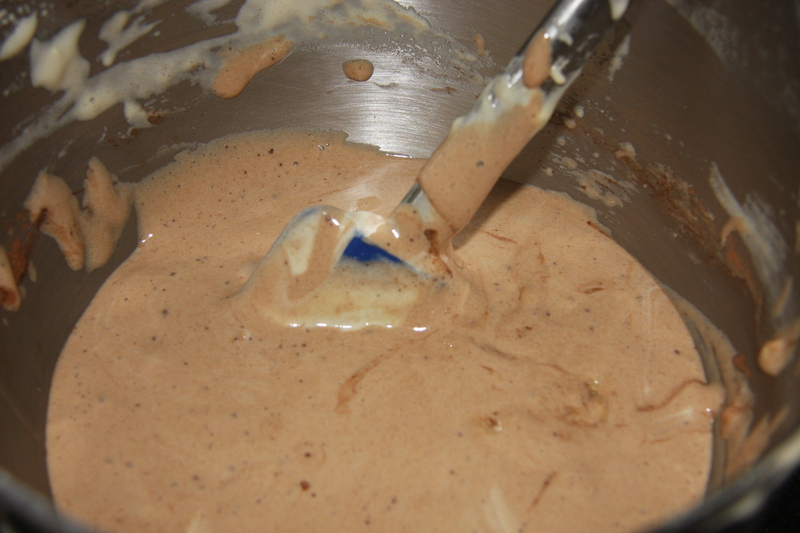 In a Kitchen Aid mixing bowl add 1 pound of butter and whip, adding your 2 tins of sweetened condensed milk (caramel). 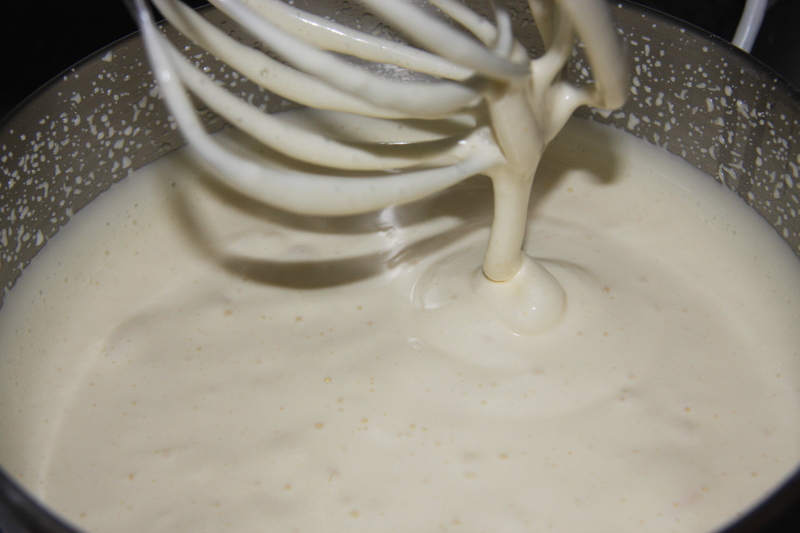 Whipping again until well blended together. Place in another bowl and set aside until ready to use. This recipe was given to me by my friend V. She needed a frosting for a cake she made and this popped into her head. Granted, I was skeptical at first because of all of the butter but after I made it, I was in love with it. It is soooo good. Seriously it is the best frosting I have tasted in a very long time. 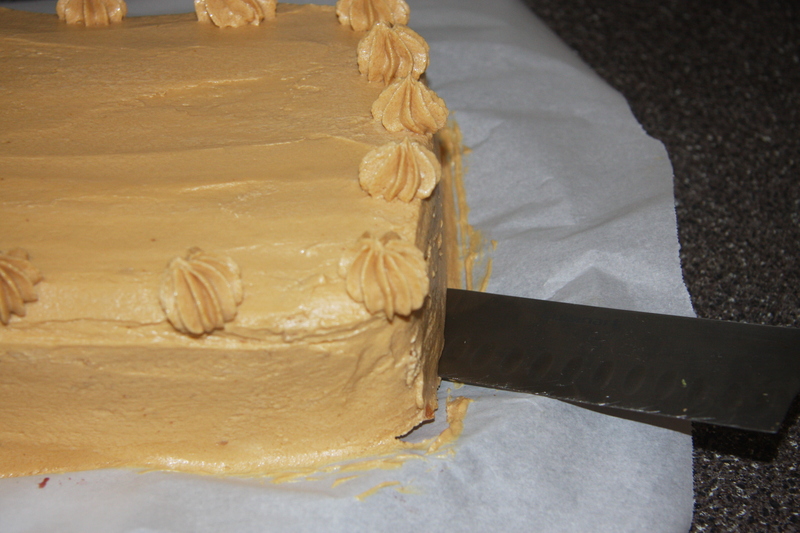 You just have to remember that after the cake has been frosted and it has been sitting in the fridge, you MUST bring it to room temperature to get the best flavor and texture of the torte and frosting. When I first served mine it was only out for about 2 hours so it was still very firm. The next day I left it out the whole day and it was DELICIOUS! 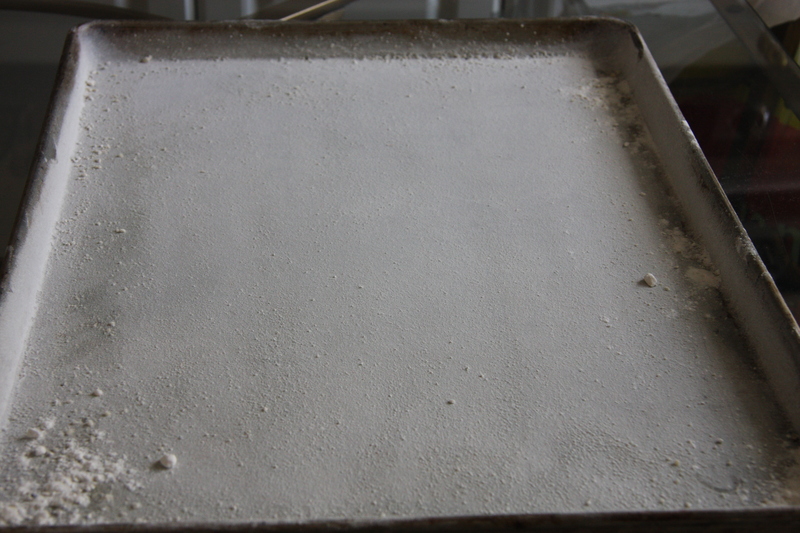 Now, grease and flour a 21- 1/2″ x 15-1/2″ pan. You could do a smaller pan but you’ll have only 3 layers. Granted they will be thicker and will take a bit longer to bake. 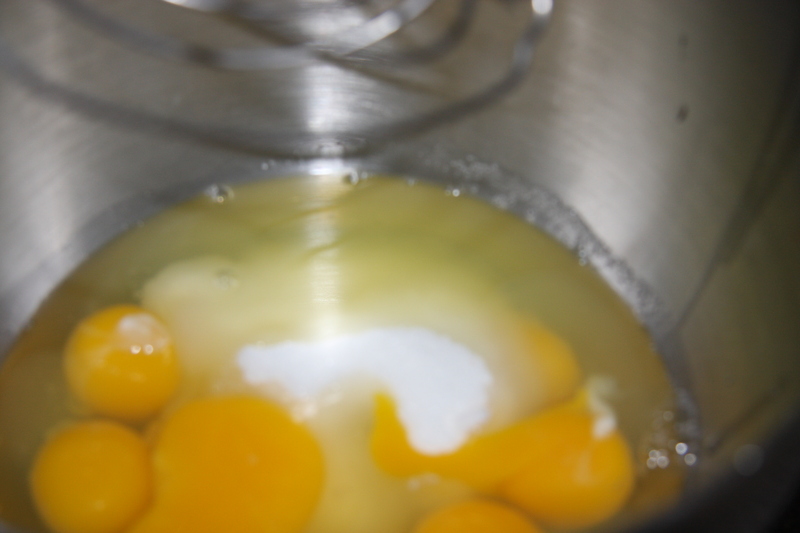 Into a Kitchen Aid mixing bowl crack 8 eggs and add 1 1/2 cups of sugar. Beat for approximately 15-20 minutes at the highest speed. After the 15 minutes you will have doubled the volume and the colour will be a very pale white or yellow. This is a trick my friend V taught me many years ago. I don’t normally separate the whites from the yolks when baking. By doing it this way you achieve the same result. Add 1 1/2 cups of sifted flour and 1 teaspoon of baking powder. Gently fold the flour in by hand. 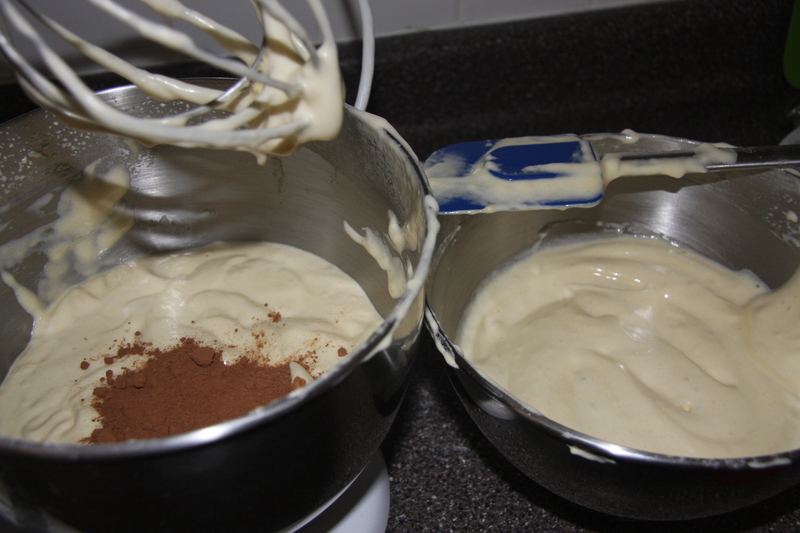 Separate the batter into two bowls. Into one of them add 2 tablespoons of cocoa powder and mix to combine. This is the result. Into your greased and floured pan pour half of your chocolate batter on one side then your white batter on the other side. Smooth to fit the pan. Bake at 350 degrees for 15-20 minutes. Do the toothpick taste to see if it is done. Insert toothpick if it comes out clean then its done. If you still have wet batter on it then back in the oven it goes for a few more minutes. Cut your cake into four equal slices. Line your serving platter with 2 pieces of parchment paper, meeting in the middle and place your first cut layer of cake on the top of the parchment. This is optional, drizzle your favorite liquor onto the cake (you can do this for each of the 4 layers) and then place 3-4 tablespoons of blueberry jam on top. 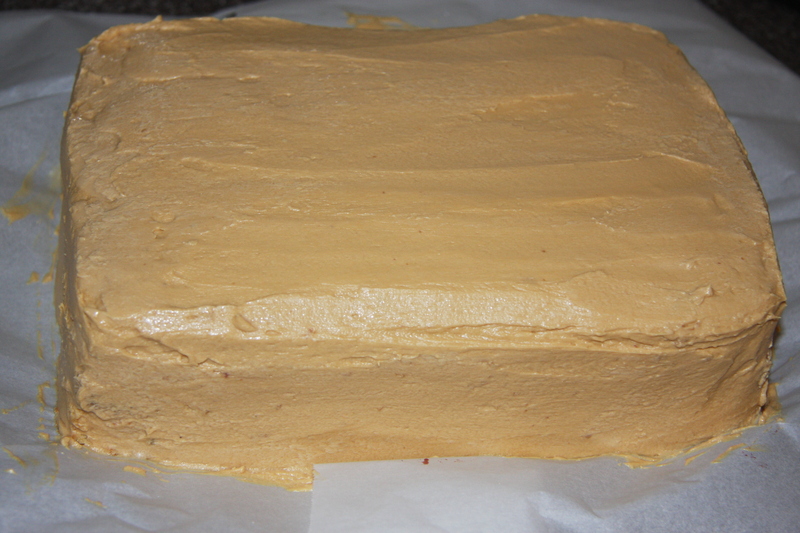 Next, place another layer of cake and add about 4 large tablespoons of icing on top of it. 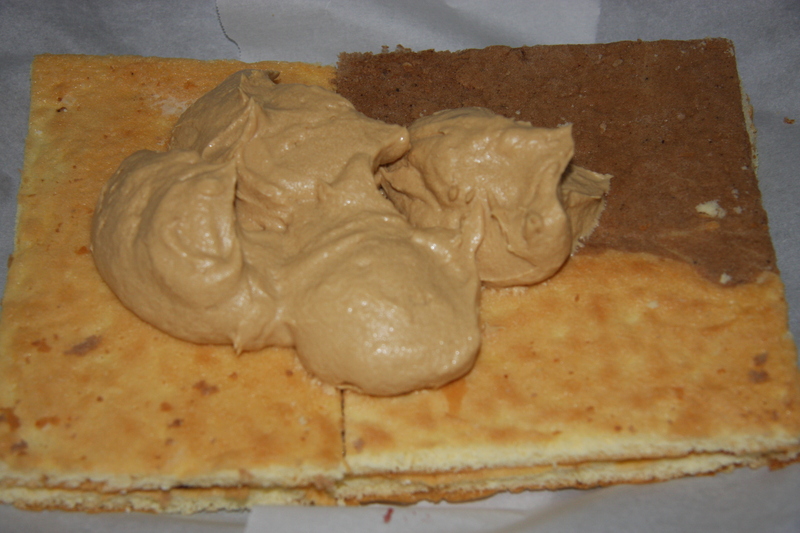 Spread to cover the whole layer. Repeat for the remaining layers. 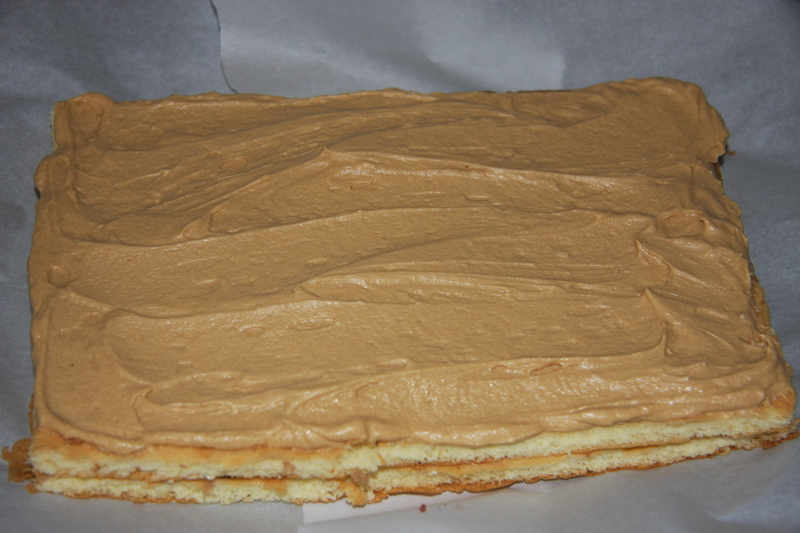 When all 4 layers are covered proceed to frost the whole cake. Decorate with a few fancy flowers. 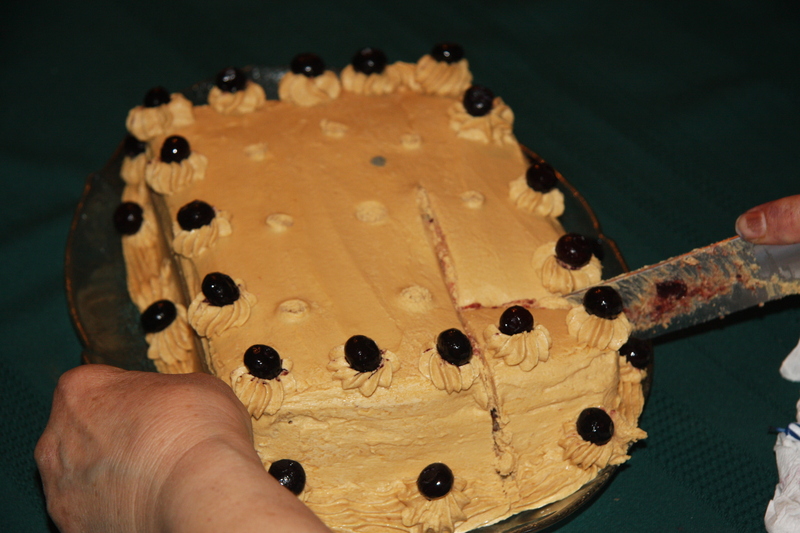 Take a knife or a spatula and gently lift one end of the cake a bit off the platter. Gently pull the parchment out from under the cake. Repeat with the other side. Make a few squiggles along the bottom edge, top with fresh blueberries and Tah Dah! Your done. I also added blueberries along the bottom edge, and when the birthday girl blew out the candles, she proceeded to cut her cake. Boil the sweetened condensed milk for 2 hours in simmering water. Remove, completely cool before opening. Open tins and mix well with the whipped butter. Set aside. Beat together the eggs and sugar for 15 minutes. They should be doubled in volume and a very pale yellow in colour. 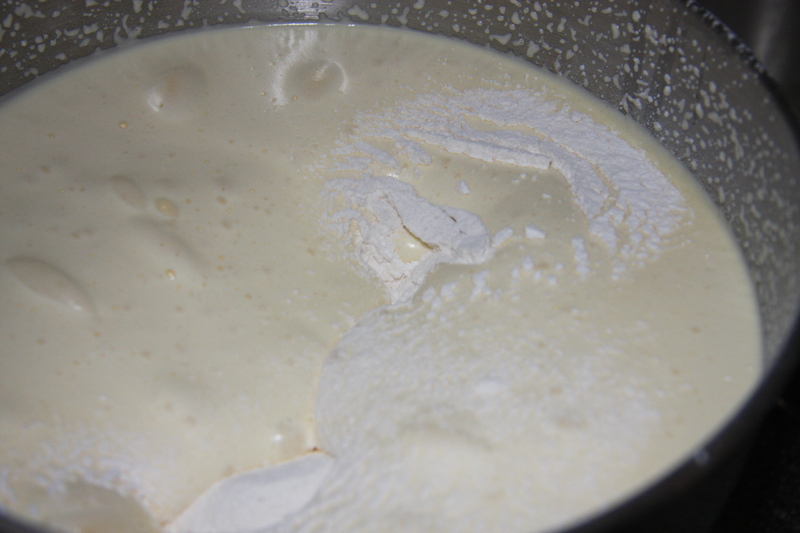 Sift flour and baking powder, add to the egg mixture by hand and mix until well blended, taking care not to deflate the batter. 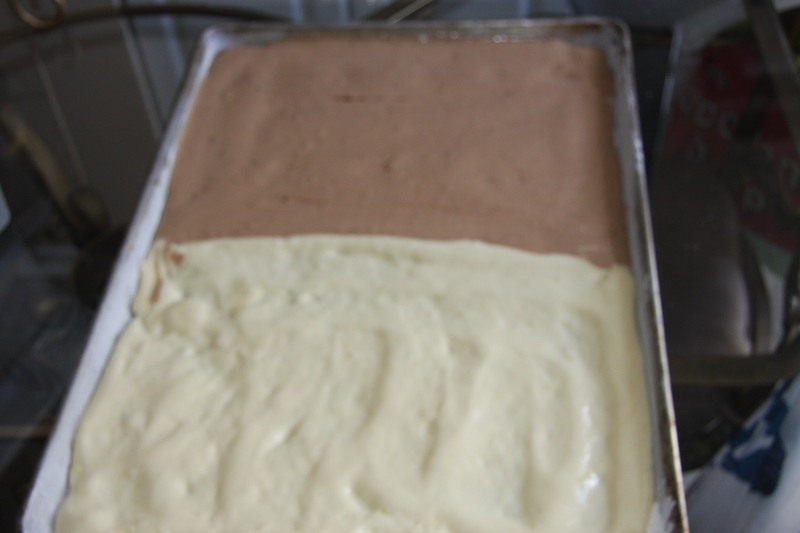 Divide the dough into 2, placing sifted cocoa powder into one bowl. 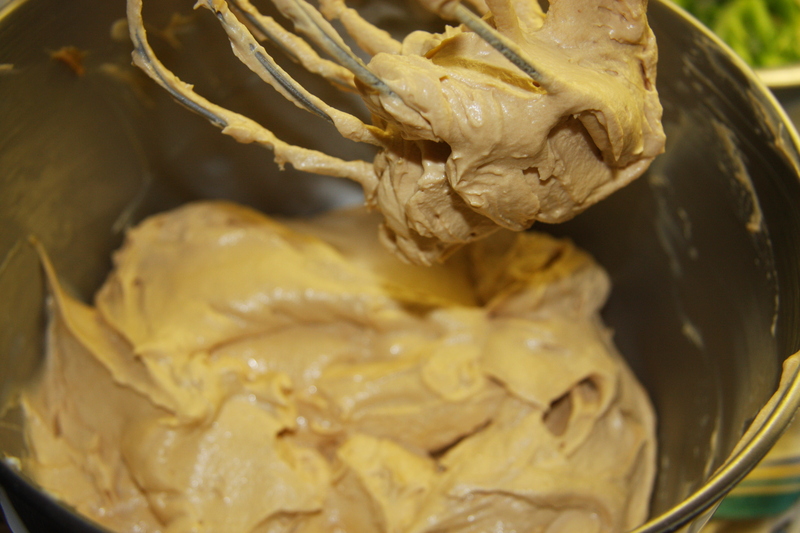 Pour each coloured batter into the same greased and floured pan. The white layer into one half and the chocolate into the other half. Smooth both to fit the pan. Place into a preheated 350 degree oven for 15-20 minutes. 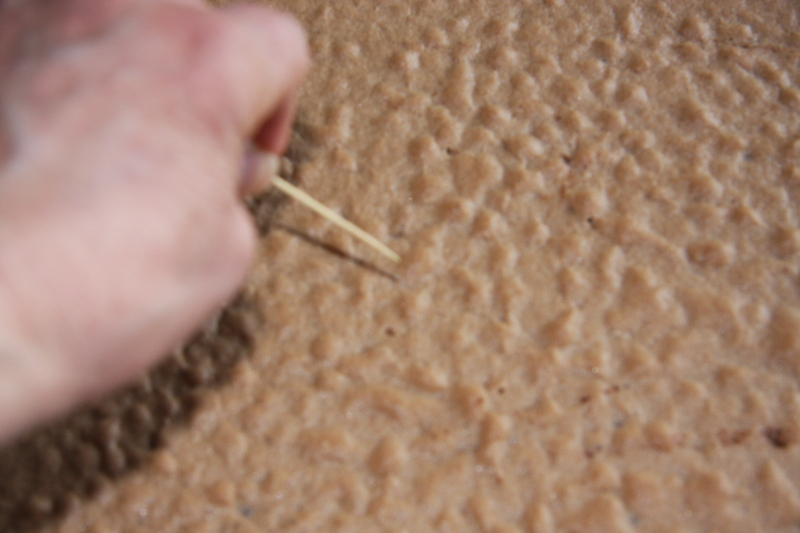 Remove and do the toothpick test. If the toothpick comes out clean then the torte is done. Cool. 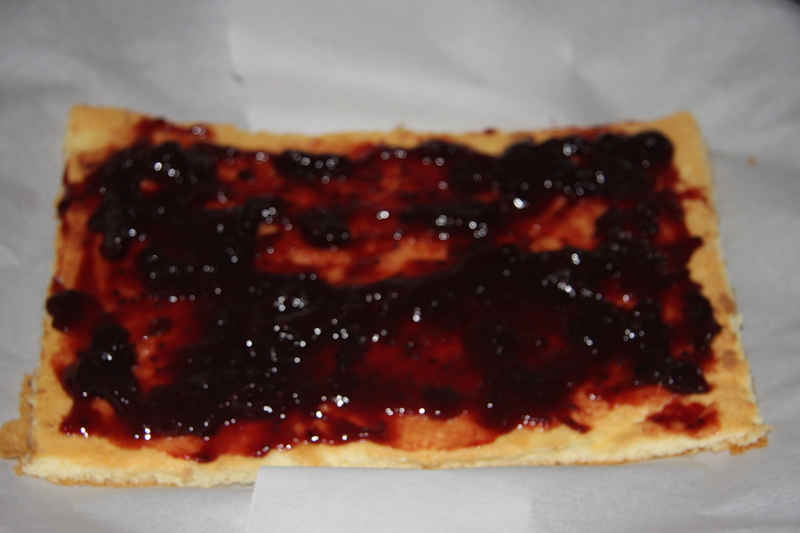 On a parchment line dish, place one layer of cake, sprinkled with a favorite liquor and top with blueberry jam. Place another layer of cake and top with liquor and the icing. Repeat with the remaining layers. Alternating. 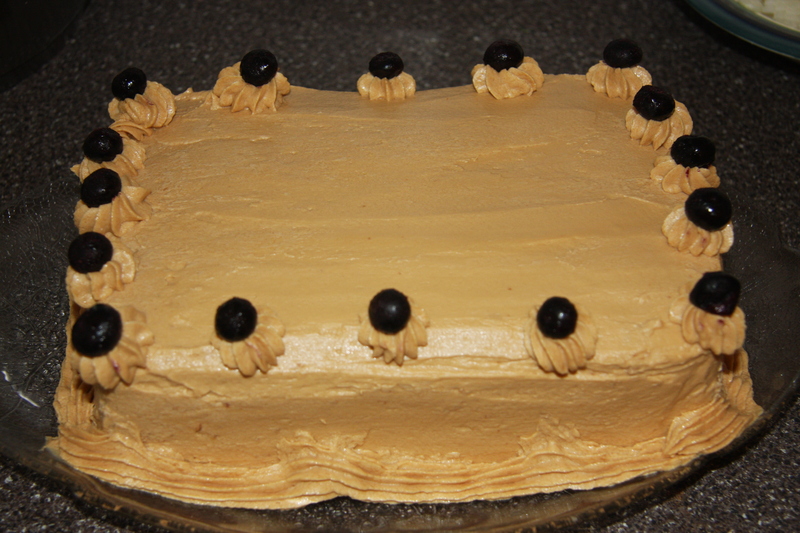 Frost the top and sides of the torte, make a few squiggles and top with fresh blueberries. Remove parchment and you are done.